Gallagher * Sweet Gallagher was rescued and rehabilitated by Southern Animal Rescue, and now lives the good life with his family in Atlanta. Mama Cassie * We pulled Cassie and her 7 babies from a local kill shelter in 2012. All have found wonderful, forever homes! Walter * This hunk of love wandered the streets until we reined him in. He now loves to run with his new mom! Ava * The spotted tabby beauty didn't care for life on the streets, and now loves her human parents! Check Out Our T-Shirt and Onesies! 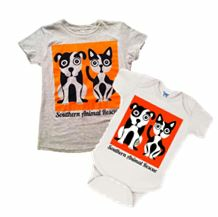 Thanks to nationally-renowned artist Sue Eifrid, Southern Animal Rescue has the coolest t-shirts and onesies! You and your little one can be fashion forward while you spread the SAR love! $25 each, which includes shipping!. Our vision: A Georgia with no more homeless, neglected, and abused pets! To rescue and re-home abused, neglected and homeless dogs and cats in metro Atlanta; to educate pet owners to properly care for their animals; and to reduce the number of feral cats and kittens through the humane practice of TNR (trap-neuter-return). Chasing ghosts! Helping you type! Our furry felines will always keep you on your toes. Each of our dogs has a special story that is sure to capture your heart. 100% of your tax-deductible donation goes to the care of our rescued pets! We have no facility, overhead, or staff expenses. "Just browsing", but not quite ready for a forever pet? Have the time of your life fostering one of ours! Can you spare some hugs and a warm bed for a homeless pet this winter? Take a look at our happy adoption tails!